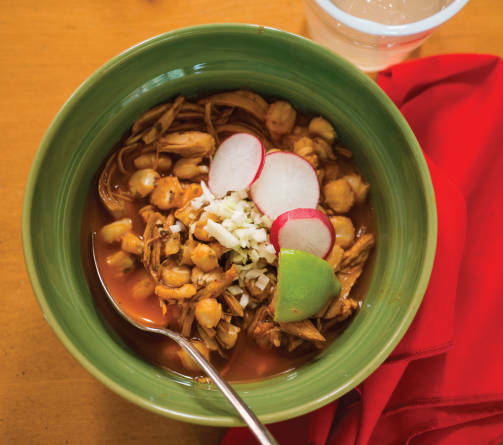 In New Mexico as well as old Mexico, turning fresh corn into posole is the most common way to preserve it. The corn is treated with slaked lime, or nixtamalized, to remove its outer skin, a technique developed by Native Americans centuries ago. The corn puffs up and becomes somewhat slicker in texture, with a distinctive toothsomeness when cooked. The technique also makes the vitamins and essential amino acids in the plant accessible when eating the corn. It’s almost always served at Christmas and New Year’s gatherings of families and friends. Combine in a large pot or Dutch oven the posole, one-quarter of the onions, 2 garlic cloves, and 6 quarts water. Simmer partially covered for 1–2 hours, until posole kernels have softened. Meanwhile, combine in a medium saucepan the remaining onion and garlic cloves, all dried chile pods, and chicken stock. Simmer, uncovered, until chile pods and onion are soft, about 20 minutes. Transfer mixture to a blender, adding only about half of the liquid. Puree, then strain to eliminate chile skin bits. Stir pureed mixture and remaining chicken stock into posole. Add chicken, cilantro, oregano, and salt. Continue to simmer over a low fire about 1 hour, until flavors have melded. Serve hot in bowls with some of the liquid, letting each diner customize with toppings, as desired.